When it comes to love, go big or go home! Cozy Cuddles is one of our biggest teddy bears in our huge 72in (6ft) life size and he’s ready to impress your sweetheart this Valentine’s Day in his romantic “Will You Be My Valentine?” shirt. 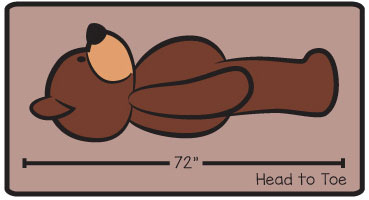 Cozy has amazing cuddly soft fur and he’s big and huggable all over. With warm brown eyes, a soft black nose and a big smile, your special someone will find him irresistible. Happy Valentine’s Day from Cozy Cuddles and Giant Teddy. 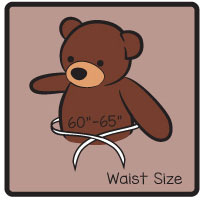 The custom shirt is specially sized for our 6ft (72in) Cozy Cuddles teddy bear, and is washable and removable. Don’t forget the greeting card! 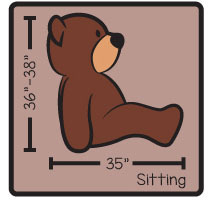 Type up to 70 words in the “Card Message” box and we’ll print it inside one of our custom Giant Teddy full size greeting cards and tuck it in the box with Cozy Cuddles. 6ft Life Size Teddy Bear wearing Happy Valentine’s Day shirt – choose your favorite fur color!